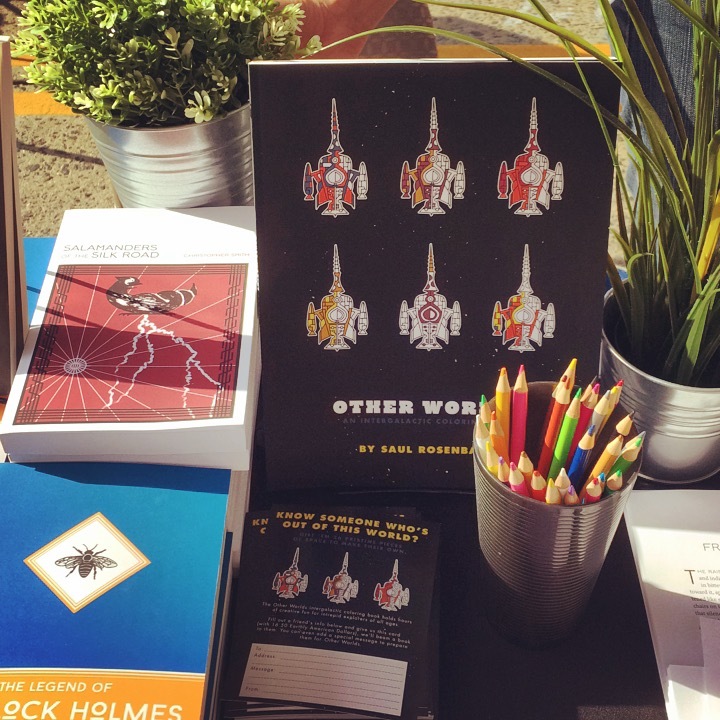 Just a hop-skip away from our home base in Philadelphia is the Collingswood Book Festival, an annual one-day event held in Collingswood, New Jersey. Other Worlds artist Saul Rosenbaum stopped by to sign a few things and hang out with us in the slightly hot but otherwise lovely day. You can pick up a copy of Other Worlds on our website! And, if you're in the Philadelphia area, keep an eye out: there may be a few coloring parties on the way. But that's not our only connection to Collingswood: Salamanders of the Silk Road author Christopher Smith lived in West Collingswood Heights (on Lincoln Avenue) from 1980 through 1987 and graduated from Haddon Township High School in 1987. He attended Audubon United Methodist Church and worked as a busboy at Rexy's Bar and then at Chubby's 1 1/2 Hearth. We had a wonderful time at the book festival this year, and we look forward to another visit next fall!